The Mesa entry gate is still there! The Mesa is a historic neighborhood located on the Palm Canyon Mesa, (lowest slopes of the San Jacinto Mountains) in South Palm Springs. It boasts a collection of unique and eclectic homes originally situated to be protected from the desert winds. Edward Fulford, a successful businessman from Los Angeles, established The Mesa in 1921. His vision of an exclusive community in Palm Springs that would be entered through a common main entrance, was realized. 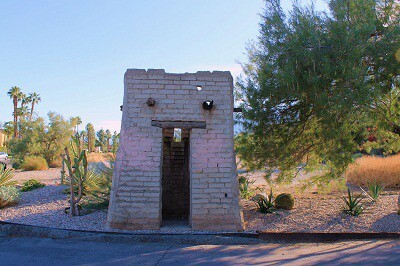 The gatehouse was built and still exists, and today is considered an iconic representation of The Mesa neighborhood. Fulford’s plan for a gated community never came to fruition as he died suddenly in 1936. Natalie Wood and Robert Wagner once owned a home on Crestline Drive. For those who love nature, hiking and rugged terrain complete with natural streams, jagged peaks, indigenous plants and a wide variety of animal life, then The Mesa is a perfect fit. Its picturesque setting is awe-inspiring and majestic, perfect for serenity seekers and those who prefer living in a community that brings the past and present together in a truly iconic desert locale. The Mesa is conveniently located just minutes from downtown Palm Springs and the many amenities it offers. Fine dining, live entertainment, boutique shopping, the Palm Desert Museum, and unique art galleries and and boutiques. The Palm Springs International Airport and Interstate 10 are an easy fifteen minute drive away, making travel outside of the Palm Springs Valley very easy and accessible. The Mesa’s varied styles of architecture range from 1920s Spanish Colonial villas to 1950s ranch houses to more recent Santa Fe style home construction. The charm of this neighborhood comes from its unique blend of Old Palm Springs and bold new modernist visions of desert living. Though it does not have an official HOA, residents have the option of joining The Mesa Neighborhood Organization which is committed to preserving and maintaining the beauty, security and status of this historic desert treasure. Location: South Palm Springs on West side of S. Palm Canyon Dr.
People who like The Mesa also tend to enjoyAndreas Hills, Old Las Palmas, Vista Las Palmas and Little Tuscany.